The Holy Cross Annual Fund makes it possible to continue the mission of Holy Cross High School through tuition assistance to our students. The Annual Appeal runs from now to June 30, 2019. Consider making your donation today! When you make an annual gift to the Annual Fund you are joining alumni, faculty, staff and friends to make an extraordinary impact on your Holy Cross community. Alumni participation sends the message to our students that the Holy Cross family is with you long after graduation. We invite you to prayerfully consider making a one-time or recurring gift to the Holy Cross Annual Fund today. Participation is renewed annually. The Annual Fund follows a July 1-June 30 fiscal year calendar. 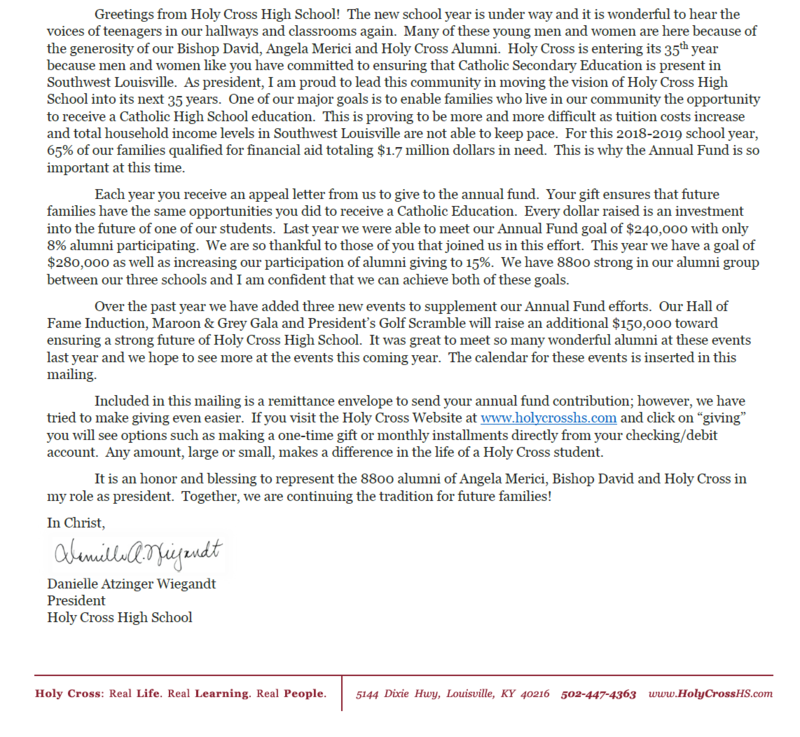 Holy Cross High School is classified as a 501(c)3 Nonprofit Organization (Tax ID #61--1053991), therefore all Annual contributions are tax-deductible. Corporate and matching gifts are applied toward an individual donors annual giving. Pledges must be paid by June 30 for Annual Report recognition. The companies listed below participate in matching gift opportunities for their employees. Check to see if your company is listed! If your company provides matching opportunities and is not listed, let us know!